New to the decorating game? Creating an inspiration board, known as a mood board, is a great way to get your new nursery project rolling! Mood boards help people to refine their ideas and narrow their design choices before they ever start decorating - a process that can save time, money and energy in the long run. They’re also fun to make and share! Wondering how to make a mood board for your nursery? Just follow these simple steps. 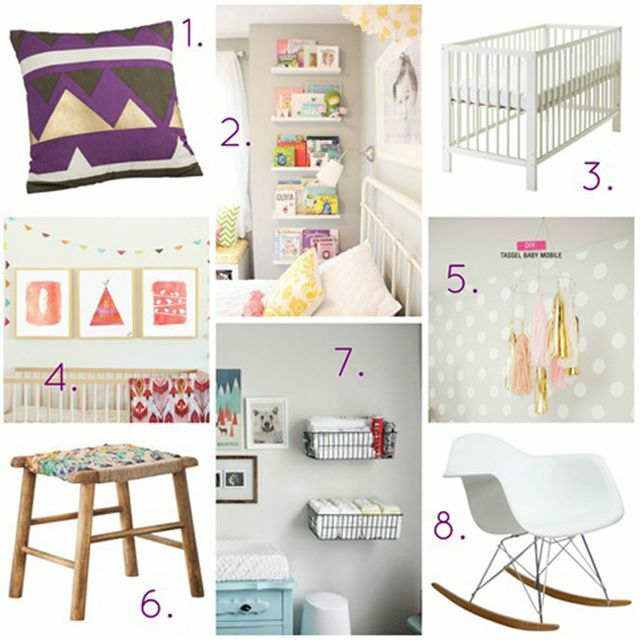 If you’re looking for nursery inspiration, Pinterest is the place to start! Create a dedicated nursery board, and get pinning! Begin with broad concepts, but don’t forget to pin the little things that make your heart melt. Remember: A single accessory can be the starting point for an entire nursery design! You’re building an inspiration bank, not a nursery! It doesn’t matter if you can’t afford it or if you’ll never end up using it. This is not the moment to be practical. Just pin what you love. Drowning in inspiration images? Settling on a color, style and/or theme is the quickest way to give your design focus. Start by identifying a decorating style you love. Chances are you already have a good idea of what turns you on. Not sure what you like? Return to your inspiration images, and go with your gut. You’ll know it when you see it! Once you’ve selected the style, think about what colors and themes work best within your style’s parameters. Love shabby chic? Think pastels and nature themes. Prefer a clean and modern space? Consider a geometric motif. Decorating rules are made to be broken, but sticking to a specific template can help you refine your concept. Photos or textile samples of bedding, curtains, etc. A mood board should give you a good feel for your design; it should not serve as a shopping list. Can’t find the right rocker for your budget? Choose the one you love, and look for something similar later. Can’t decide between multiple bedding sets? Keep it all in play! You won’t know what looks best until you actually start building your board. Ready to start building your mood board? First, you’ll need to decide on a medium. Interior designers generally prefer physical boards, which give more accurate depictions of color and texture. (Think cut and paste/pin.) But digital boards, which can be easily rearranged and shared, are also a great option. Not so handy with Photoshop? Try using one of these simple tools. When coordinating your inspiration images, start with textiles. Pinning bedding and other soft items down early gives you the opportunity to fine-tune your palette, allowing you to pick the perfect shade of paint to match your must-have items. Once, you’ve gotten color out of the way, concentrate on coordinating patterns and creating variations in texture. When in doubt, try putting these 5 simple rules to good use. Need help mixing and matching individual furniture pieces? Check out this handy guide. Finally, don’t forget to include a few of your favorite mood-setting accessories. After all, adorable is all in the details!